San Francisco is a city of contrasts. Historically, it has been a haven for many seeking a better and more creative life – including immigrants, queers, artists and activists of all stripes. But it is increasingly becoming a playground for the rich; our African-American and working class neighbors are being forced out. Our beloved city is becoming, day by day, less and less of the mix of cultures that makes it unique. From the outside, San Francisco may seem like an exciting hub of technology and innovation, but to those of us who grew up and live here, it’s heartbreaking to see how fast our city is changing. 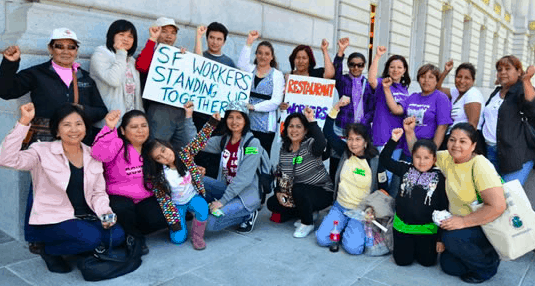 That’s why I joined SF Rising, a coalition of grassroots groups based in the Mission district. 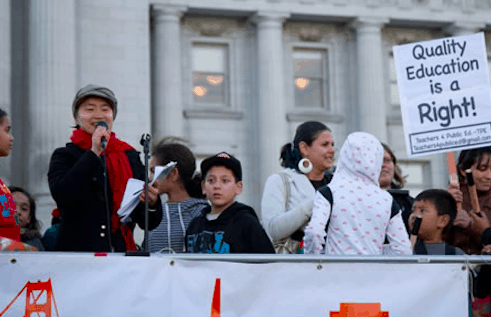 We work to unite the city’s low-income and working-class communities of color: African American, Latinx, Chinese, Filipino and more. Together, we are our city’s rising majority, and if we work together from the ballot box all the way to city hall, we can keep San Francisco great. Education ensures our society offers fair opportunities to everyone. In August, San Francisco became the first U.S. city to offer free college tuition to all of its residents: this was the fruit of a five-year campaign, which culminated in a ballot initiative in November of 2016. Since August, enrollment at the City College of San Francisco has jumped by more than four thousand students. The initiative, which also offers living expenses to low-income students, pays for itself with a small tax on the transfer of properties over $5 million. We did it. We now want to build on this success statewide – we’ve launched College For All, a campaign to offer free tuition to all California residents at any California Community College, California State University, or University of California campus. We did the math, and this can also pay for itself: a small tax on the estates of only the wealthiest 0.2 percent of Californians would raise $4 billion for education. Is this worth it to offer a life-changing opportunity to thousands in our state? We think so. To reach this goal, we’ve got to get there – one signature at a time. To get on the ballot in November, we need to collect 585,000 signatures by April 24th. We started collecting signatures over the weekend of January 27th, on the campuses of San Jose State, UC Berkeley, and UCLA. Our effort was the first in a series of monthly #protesttopower canvasses, or person-to-person campaigns, that will be sponsored by People’s Action across the country this year. 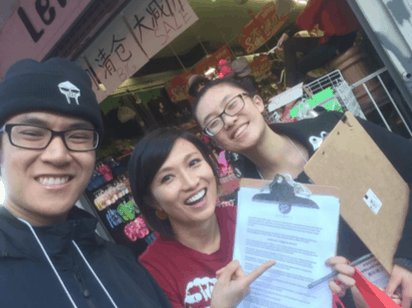 Our friends from the Chinese Progressive Association joined us in San Francisco to collect signatures in Chinese. We also collected at four sites in downtown Fullerton, and Inner City Struggle, our sister grassroots group in downtown L.A., collected signatures there. We’ve collected thousands of signatures so far, so we’re off to a great start! There are over a hundred and fifty public college campuses in California, so if we can get signatures from even a small percentage of the state’s student population – we’ll easily reach our goal. This is how change happens, this is the work: door to door, conversation to conversation, changing one mind and one heart at a time. Sometimes it feels tedious, but we know every signature gets us closer to our goal. We’re finding that once people hear about our initiative, it’s easy for them to get on board, whether they’re students or not. Every family understands the benefit of expanding access to education. If this measure gets on the ballot, we’re also hoping it brings out a lot of young people to vote. Young people have the lowest turnout of all groups in California; they’re either disenchanted, don’t know what’s on the ballot, or haven’t taken the time to find out. But when we talk to them, and they realize they can make college free with just one vote, they want to. This is what democracy looks like. And if we really want to be the change we’ve been waiting for, this is how we do it: by standing up, one brave person at a time. People’s Action’s next nationwide canvass will be February 24. Join us!